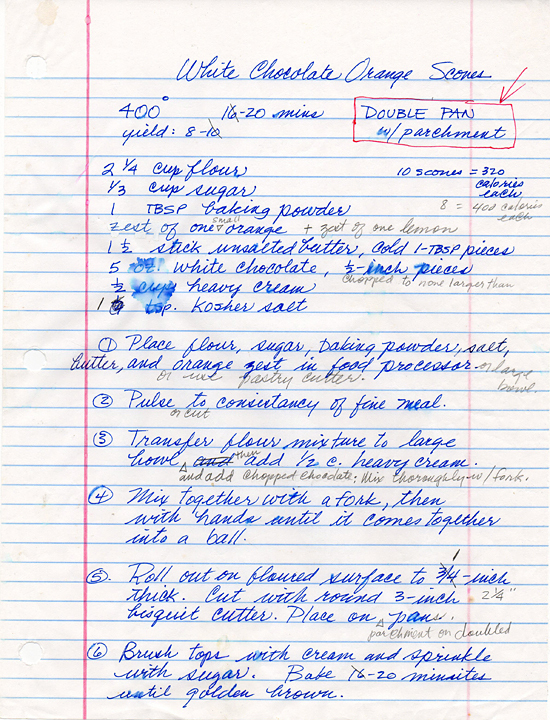 I have been making this scone recipe since around 1996, as I recall. I don’t remember where the original recipe came from and it has gone through several permutations. This is my favorite Sunday morning breakfast, accompanied by a big cup of great coffee. I only eat them on Sunday, so I look forward to them all week, which makes them even more special. The white chocolate is chopped up into pieces no larger than 1/2-inch, which means there are a lot of much smaller pieces, down to chocolate dust size. The dough is permeated with white chocolate, along with the orange zest, which makes the texture and flavor rich and amazing. I love them warm, so the white chocolate is soft throughout. Oh man, I need to go make some more of these right now. Use the best white chocolate you can afford, not a cheap imitation. White chocolate should have cocoa butter, sugar, milk solids, lecithin and real vanilla. I prefer Callebaut, but I’ve made these scones successfully with white chocolate bars I bought at the food market, like Lindt, Ghirardelli, etc. Just check the ingredient list to make sure you are getting the real deal. You can use your food processor, but I like to use a pastry cutter so I can control the result. The butter should be cut in to the texture of meal, then the chopped chocolate is mixed in with a fork. Add the heavy cream and continue mixing with your fork. 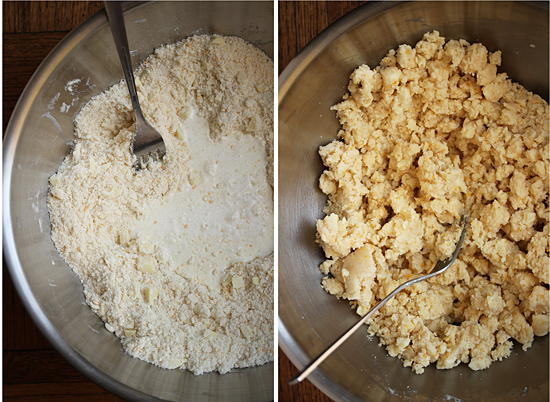 I know it looks like it will never come together into a dough, but keep mixing. Do Not add more cream, under pain of dismemberment. Eventually it will develop clumps, which you can squeeze together and mold into a ball. Flour your hands and rolling pin a little. 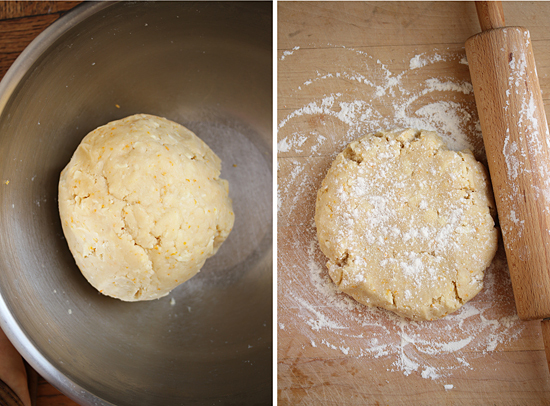 Mold the dough ball into a disk and roll out on a little flour to about one inch thick. 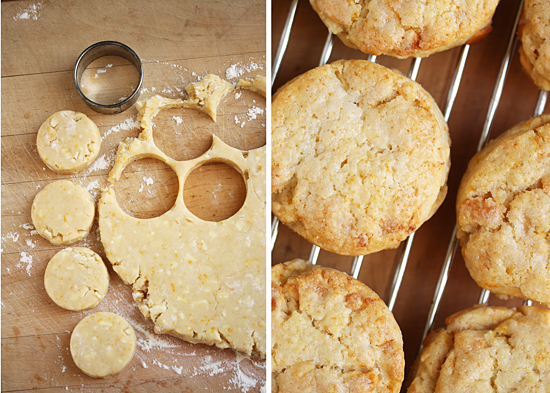 Cut out disks with a 3-inch biscuit cutter and place on parchment on a double pan. Brush with cream and sprinkle with sugar. Bake until your kitchen fills with that chocolate-y orange-y smell. Ooh baby… While they’re baking, make your best coffee. Get a little plate and a fork. 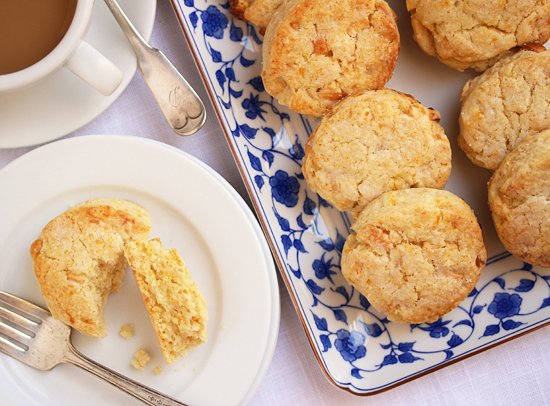 Stand poised by the oven, ready to get those scones on a rack and one onto your little plate. Oh yes. This is my beloved original written recipe, which you can see has been wrinkled, sploched, dripped on, erased, written in pencil and had the calories calculated. I had a special place I filed it so I always knew where it was. I hope you try these. I really do. 1. Preheat oven to 400 degrees F. Line top pan of doubled baking pans with parchment. 1. 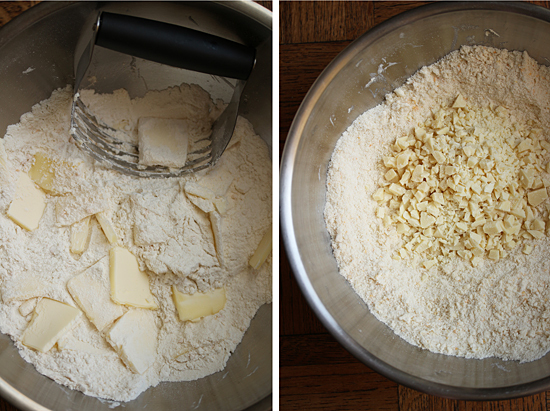 Place flour, sugar, baking powder, salt, butter and orange zest in a large bowl, or food processor. 2. 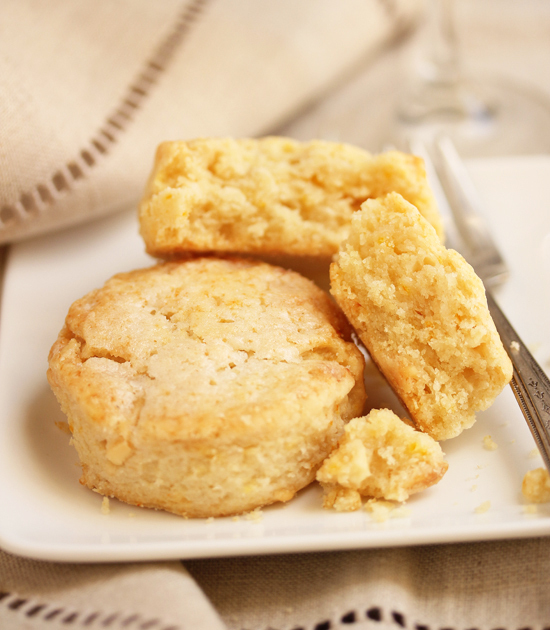 With a pastry cutter, or processor, cut in butter to consistency of fine meal. 3. If processing, transfer flour mixture to large bowl. Add chopped chocolate and mix in thoroughly with a fork. 4. 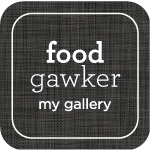 Add ½ cup heavy cream and mix together with a fork, then with hands until it comes together into a ball. 5. Roll dough out on floured surface to 1-inch think. Cut with round 2-1/4 to 3-inch biscuit cutter and place on parchment on doubled pans about 1 inch apart. Reform scraps into disk, roll out and continue cutting until all dough is used. 6. Brush tops with cream and sprinkle with sugar. Bake for 16 – 20 minutes until golden brown. Best eaten when warm. Note: Wrap individually in plastic wrap and freeze in large zip bag. Reheat in microwave, partially unwrapped, for about 20 seconds or until quite warm. I am happy to see I can eat 10 of these for just 320 calories. Done! I love a good scone recipe. This one looks fabulous. I can’t wait to try it. What beautiful scones. They are one of my favorite treats. May I offer my compliments also on a very well done step by step tutorial. Brava! 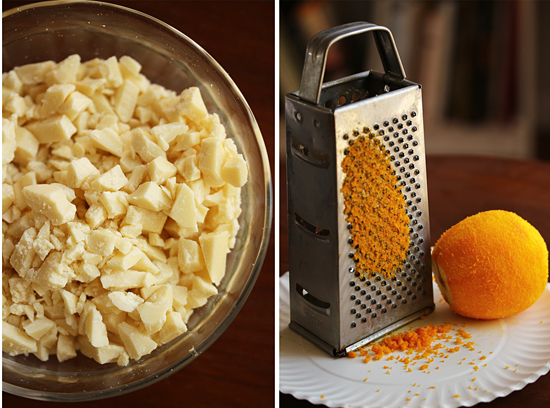 I love the idea of white chocolate and orange. And I’m with you on Callebaut white chocolate. It really is a superior product.